A friend on Facebook recently posted this link, which discusses the explosion of the book self-publishing industry this past year. As expected, the comments section is rife with somewhat derisive outbursts from writers who have had success via the traditional publishing route, and who are skeptical about the self-publishing path. I am proudly one of those writers who has done well in the traditional commercial publishing world. (Well, I’ve done better than some, worse than others.) I’ve authored two well-received books of fiction, one textbook in electronic format, and one peer-reviewed academic book, also in electronic format. I think I’ve learned a few things from the process. The publisher of my fiction books (TSAR Books in Toronto) is exemplary. They care about their writers, and inject a lot of value into the book creation process via editorial input and design. The covers of my two books with them were outsourced to artists whose careers I am proud to have helped advance. Certainly, those lovely designs I could not have imagined myself. And much of the publisher’s editorial input was enormously valuable. In fact, I am doubly proud to say that the co-owner of the company, legendary author M.G. Vassanji, was greatly involved in editing my text. TSAR was also instrumental in arranging for some media attention for my work, and certainly in using their distribution networks to place my books in the leading mainstream stores. Their campaigning on behalf of their authors lead to my first book being nominated for, and ultimately winning, a national book award. Clearly, being associated with a traditional publisher worked out well for me. With my textbook, the experience was a bit different, due mostly to the nature of the content. A textbook publisher has a somewhat different role to play. They were valuable in checking the accuracy of my content, ensuring that any links or content I included did not violate any copyrights, and visually assembling the finished product. Many textbook publishers rely upon the author to provide the market for the book, often by assigning the product as a class reading. Therefore distribution is not where these publishers shine. Keep in mind that radio shows and writers’ festivals never feature readings from textbook authors, so fame and the progression of one’s writing career are rarely priorities when dealing with textbook publishers. The advent of electronic publishing has complicated the field even further. My textbook was solely a digital product. This means that the distribution network and printing services of a traditional publisher were not in play. It also means that self-publishing has really come into its own, because the digital format really helps to level the playing field between commercial publishers and individuals wishing simply to get their product into the wild. A few years ago, I would have been one of those “traditional writers” criticizing the self-publishing movement. I would have argued that self-published authors do not benefit from quality control, proper editing, professional marketing, and proper distribution channels. To a large extent, those things are still true. But the unspoken truth of the matter is that we of the author caste do look down our noses at those writers who have resorted to doing it on their own. The assumption, after all, is that self-publishing was their last resort after having been rejected by proper publishers. The implication, therefore, is that self-published work is of lesser quality than traditionally published work. Frankly, I still believe this to be largely true, especially in the fiction genre, but with notable exceptions. Mind you, publishers do not have a magic litmus test for quality or success. Many remarkable pieces of literary fiction were rejected by multiple publishers before finally finding a home. My own first book, the eventual winner of several awards, was rejected by more publishers than I care to list before TSAR saw something in it. So rejection by an agent or publisher is not necessarily an indication of poor quality work. Candidly, I believe that many self-publishing writers –again, largely in the fiction domain– are driven more by the lure of wealth and fame than by a dedication to the art of writing, The traditional path of the literary writer used to be slogging it out in the literary magazines, doing public readings, seeking publication in small press anthologies, learning artistic discipline via good old-fashioned hard work, then finally assembling an opus whose qualities a publisher would recognize. This is not the path typically taken by those who seek to circumvent commercial publishers, and I believe it shows in the general lack of writing discipline I perceive in a lot of self-published work. Hence the rise of vanity presses, which capitalize on a writer’s desire for fame. Such companies sell distribution and packaging services that essentially produce a physical book that a writer can show off, with little hope of an actual presence in top bookstores. Notable exceptions abound, of course, but they are certainly not the norm. Vanity presses are about appearances. Does it look like a book? Is the author’s name on it? But very little attention is given by the vanity press to the actual content of the book. Traditional small literary presses, on the other hand, are renowned for the care and dedication they laud upon the words, first and foremost, with packaging, marketing and distribution a secondary consideration. But, again, everything has changed of late. In Canada, small presses have never been financially stable, but now are barely solvent. High quality writing can find a home on electronic journals, but to be rendered into physical book form is a challenge everywhere, except maybe in India, where the glory days of physical publishing still linger. And now that the world’s biggest online retailer of books –Amazon– has entered both the ebook and self-publishing industries, the era of the self-published author has truly arrived. Amazon and its competitors offer an instantaneous global reach, with supreme control of format and content retained by the author. By pushing content to users’ Kindle ebooks, Amazon now bypasses the bookstores themselves, and allows pricing to be low enough to remove most financial barriers to market. 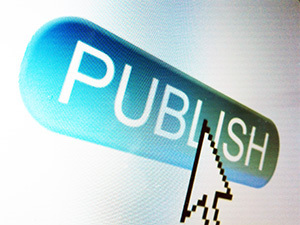 Every author now needs to seriously consider self-publishing as an option. My bias, though, is that fiction writers are best advised to seek traditional publishers, if at all possible. The imprimatur of quality offered by a supposedly objective third party is highly useful for artistic products. Whether or not that quality is real is debatable. (I believe that it is indeed real). But the perception persists that artistic product vetted by an intermediary, such as a publisher, is more worthy of attention than that offered directly by the content producer. The exception, of course, is when the artist is well established and known. A famous and successful artist (Radiohead, Larry Niven, Steven King) is free to self-produce or self-publish his or her artistic product, and market directly to the consumer –via iTunes, Amazon, personal websites, etc– without need of involving a middleman, whether that middleman be a small press, large corporate publisher, or major record label. But most fiction writers who are considering self-publishing are not famous, established names. For such individuals, I believe, remaining in the traditional publishing realm is advisable. For non-fiction writing, this is not as necessary. And here is where the power of self-publishing can be well realized. When your product is opinion, instruction, or some other product seated in the factual universe, what matters isn’t a relationship with a publisher who will vet your and attest to your qualities. Rather, what matters is the expertise that you can reliably demonstrate. What this means is that a lawyer writing a book about law can probably self-publish without anyone accusing him of bypassing the “quality control” of a publisher. The same applies to a plumber self-publishing about sink repair. The gravitas and expertise implicit in their professional titles is all the vetting they need. Of course, a traditional press offers a larger marketing machine. But if your goal is to get your product into the wild, and possibly use it to support your other professional activities (lecturing, consulting, teaching, etc), then self-publishing is, in my opinion, an excellent option. And so it is time for me to put my beliefs to the test. Later this week, I will be self-publishing my new introductory textbook on Epidemiology. This is an experiment, of course. But I figure I already have some street cred as a widely published author. And I have the supposed expertise as a University professor who teaches Epidemiology. So that should be enough to get a non-peer reviewed book into the market while bypassing the traditional publishing machine. I hope. Maybe. Stay tuned to this site. I’ll let you know how it goes!